The phrase ‘Big Five’ was coined by big game hunters in Southern Africa and refers to the five most difficult animals in Africa to hunt on foot. The term is still used in most tourist and wildlife guides that discuss African wildlife safaris, but nowadays to describe the five species of game that wildlife enthusiasts strive to see when visiting game reserves. The Big Five are the Lion, African Elephant, Cape Buffalo, Leopard and the Rhinoceros. After the extensive renovations to the former Settlers Motel, it was appropriate to unveil the new Big Five Motel. From our humble roots in South Africa, we found it fitting to outfit the motel in animal themed decor, bringing a small bit of our former home to our new. From all of us here at the Big Five Motel we wish to welcome both past guests of Settlers Motel and future guests of the Big Five Motel. We thank you for your support and patronage and trust we can make your stay a comfortable and unforgettable experience. Bruce and Jenni Anderson look forward to welcoming and hosting you at the Big Five Motel! Is a large carnivorous feline of Africa, having a short tawny coat, a tufted tail and in the male, a heavy mane around the neck and shoulders. 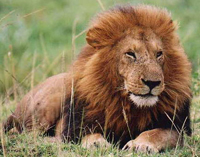 Of all feline game, the lion is the second largest by body weight after the Tiger. Lions generally live in groups called prides which consist of approximately five related females, their cubs and one or two males. Is a large horned bovid animal. It can grow to 1.7 metres tall, 3.4 metres long and weigh between 500 – 900kg. The ancestry of the Cape buffalo is still unclear as it is not closely related to either the Wild Asian or American Plains buffalo. 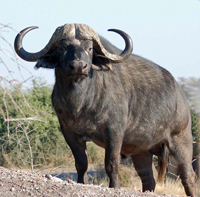 Owing to its unpredictable nature, the buffalo is highly dangerous and, of the Big Five, kills more hunters than any other. Is the smallest of the five weighing in at less than 100kg. A carnivorous feline that is extremely agile, a stealthy predator and one of the most solitary hunters in the wild. Most often mistaken as a cheetah, the leopard has dark irregular rosettes whereas the cheetah has simple filled spots. 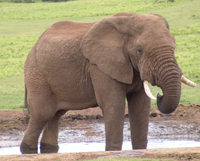 Is the largest land animal. Possessing a long trunk, this is the elephant's most important and versatile appendage. According to biologists, the trunk may be made up of over one thousand muscles making it sensitive enough to pick up a single blade of grass, yet strong enough to rip branches from trees. The rhinoceros is characterised by its large size reaching a body mass of between 2 and 3 tons. The two different species are the white and black rhinoceros. They can be distinguished by the shape of their lips. The white rhino has a square lip whereas the black rhino has a pointed lip.